"…Spinning Plates is out to prove that no matter how fancy or bare bones a kitchen is, running a restaurant takes a special kind of family." Grant Achatz is one of the most acclaimed chefs working today. His restaurant, Alinea, in Chicago, has been named Best Restaurant in North America and seventh best in the world by the industry bible, S. Pellegrino’s Restaurant magazine. Gourmet magazine declared Alinea the “Best Restaurant in America” in its twice-per-decade list of America’s Top 50 Restaurants. Achatz himself was named the “next great American chef” by The New York Times and “Rising Star Chef in America,” by the James Beard Foundation. 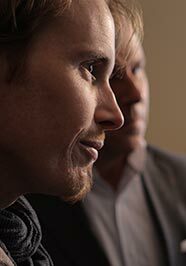 Born in Michigan in 1974, Grant Achatz grew up in the restaurant industry. By his 12th birthday, Grant was mastering the basics and developing the skills that would lead to his becoming one of the foremost innovators in the field of progressive cuisine. A graduate of the Culinary School of America, Achatz spent 4 years working with Thomas Keller at the acclaimed French Laundry in the Napa Valley. Achatz thrived in this highly creative and dedicated environment, and after two years became sous chef. Achatz realized a lifelong dream by opening Alinea in Chicago in May 2005. The restaurant received early attention and was nominated by the James Beard Foundation as the Best New Restaurant in America. For Achatz, cooking and plating food is an art form, and his motivation comes from doing things no one else has done before. His extraordinary detail is part of what makes his preparation so exquisite and he is undaunted by spending 12 hours working on what will become one bite of food. As he struggles with downplaying his anxiety leading up to the Michelin ranking, he finds time for his two sons, embarking on creative adventures. In 2007 Achatz was diagnosed with cancer of the mouth which would lead him on a journey to save both his sense of taste and his life. His is a story of dedication and commitment to his unique artistic calling. First open in 1852, the original country diner was a popular stagecoach stop for cross-country travelers. 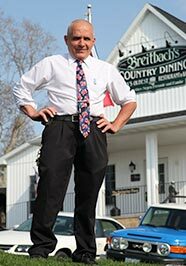 In 1891, it was purchased by the Breitbach family, and Breitbach’s Country Dining has been in the family ever since. Mike Breitbach is the 6th generation owner, and he runs the restaurant with his wife, Cindy, their two children and son-in-law. Breitbach’s is the quintessential small town family restaurant, a place where townspeople “check in – it’s how everyone starts their day.” Cindy Breitbach says, “It’s a restaurant, but it’s more of a community center.” Friends and neighbors stop by and say hello to other friends, over a hot cup of coffee and a pastry. Known for its delicious pies by loyalists and regulars spanning hundreds of miles – Cindy bakes all the pies - Breitbach’s Country Dining serves hearty breakfasts and their famous buffets to the residents of the local communities, and to travelers who now stop by in Winnebagos. They are regionally famous for their fried chicken, which has hypnotic qualities. When a tragic Christmas Eve fire burned the well-loved establishment to the ground in 2007, the community rallied behind Mike Breitbach, contributing resources, materials and manpower. The support of family and friends as well as the sense of tradition and history and what Breitbach’s Country Dining has stood for gave Mike Breitbach the courage to rebuild. A small Mexican restaurant, La Cocina de Gabby was named by Francisco for his wife Gabby, who learned to cook from her mother. Now the whole family spends their days in the kitchen, preparing meals for customers while Francisco and Gabby’s daughter Ashley plays among the pots and pans. For Francisco and Gabby, food is the very essence of life, and the main meal of the day is their offering of nourishment and delight to the old and the new generations. The recipes have been handed down from generation to generation. Gabby loves her mother’s food, and she prepares it with pride, under her mother’s watchful eyes. “The true seasoning is in a person’s hands,” she says in Spanish, kneading dough. For Francisco, the delicious smells of the food reminds him of his childhood. Food is family. But the challenges of maintaining a successful business, owning a home and raising a child are compounded for Francisco and Gabby, who hope that La Cocina de Gabby will provide some financial security for themselves and for Ashley. 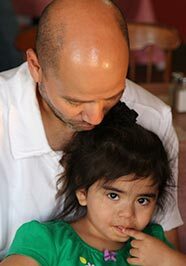 If you'd like to help the Martinez family, you can find more information here.